Plants pale green, tubular, up to 5 cm tall. Thalli narrowly linear below, gradually expanding upwards to a width of about 5 mm, rarely branched. Cells in surface view in no definite order, (rounded) angular, 4-8 µm in largest diameter. Thallus membrane 8-10 µm thick, cells 6-7 µm high, approximately square. 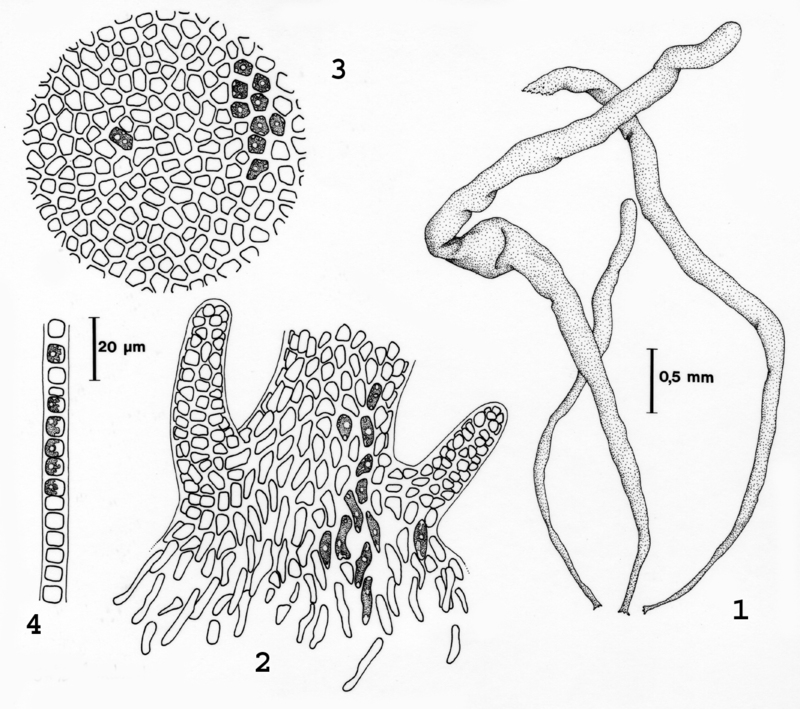 (Description and illustration from Stegenga et al. 1997). Found in the upper eulittoral and supralittoral fringe, both in rock pools on exposed coasts and on salt marsh plants. Recorded from Langebaan Lagoon on the west coast to the Morgan Bay area (13-43). World distribution: widespread in temperate waters (Guiry & Guiry April 2012). Type locality: Helgoland, Germany (Silva et a.l 1996). Blidingia minima. 1. Habit. 2 base of plant. 3 Surface view of thallus showing cell arrangement and stellate chloroplasts. 4 Cross section. Illustration from Stegenga et al. (1997) (Herre Stegenga). Guiry, M.D. & Guiry, G.M. 2012. AlgaeBase. World-wide electronic publication, National University of Ireland, Galway. http://www.algaebase.org; searched April 2012. Kylin, H. (1947). Über die Fortpflanzungsverhältnisse in der Ordnung Ulvales. Kungl. Fysiografiska Sällskapets i Lund Förhandlingar 17: 174-182.